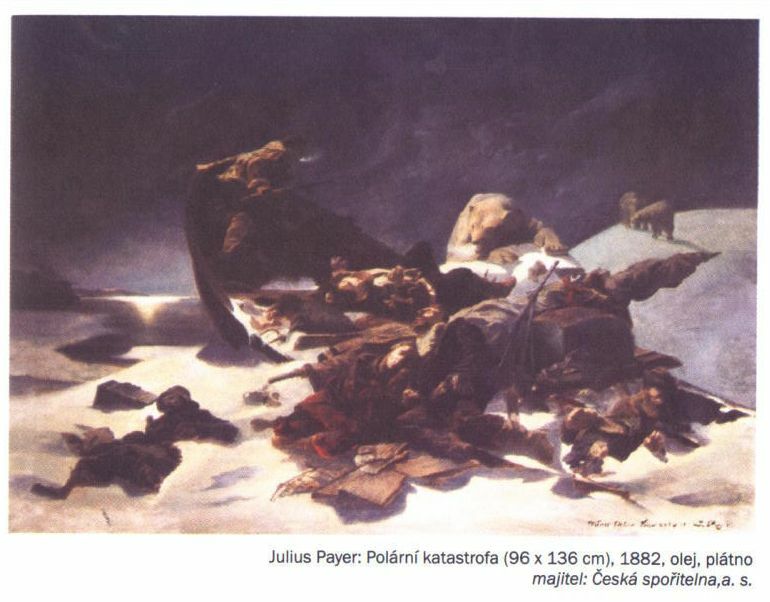 Julius Payer, Austro-Hungarian military officer, mountaineer, arctic explorer, cartographer and artist, painted four monumental paintings concerning Sir John Franklin's expedition (1845 - about 1848) in the 1880’s. These paintings are lost for many decades. The last verified information is from 1932 when the paintings were part of a private collection in Brussels. Any information about current whereabouts of the paintings, their history and photos or any other reproduction (especially any reproduction of the original “Starvation Cove” painting) are warmly welcomed at info@franklinova-expedice.cz. Any linking and reposts are welcomed, too. Updated on July 16: new information concerning the newly discovered study of the Starvation Cove. There is no known reproduction of the fourth painting of the series, the “Starvation Cove”(which was painted first!). It should look like the “Polar catastrophe” (see bellow), but there should be a sextant in the front of the image (as in another version of “Starvation Cove” painted in 1897, see bellow). The main difference between the original and now lost “Starvation Cove” (from ca 1882) and its later version from 1897 is the number of painted members of the Franklin expedition: there is one additional person in the leftmost of the 1897 version. All paintings probably have a height of about 3.23 meters and width of about 4.5-4.8 meters depending on frame size. Probably the last public exhibition of these paintings under auspices of Payer’s “art agent” Charles Sedelmeyer took place at spring 1896 in London Grafton Galleries. It seems all four paintings were sold to the “America” (USA) during the exhibition or soon after its end. Their trace is then lost for few decades. Payer painted another even bigger version of “Starvation Cove” in 1897. This painting is now placed in the Geophysical Institute in Prague, Czech Republic. Its fate is interesting, too, but it is out of scope of this article. The four original Franklin series paintings surfaced again in 1932 in Brussels. They were owned then by art collectors O’Mearas. They apparently wanted to sell them at that time. See Cyriax collection stored in the Library and Archives Canada. Paintings reportedly survived World War II in Brussels and were reportedly placed there in 1950’s. This information based on a single article and can be wrong. Another copy or study of “Starvation Cove” sometimes called the “Polar Catastrophe”. It is owned by the Czech bank “Česká spořitelna” . 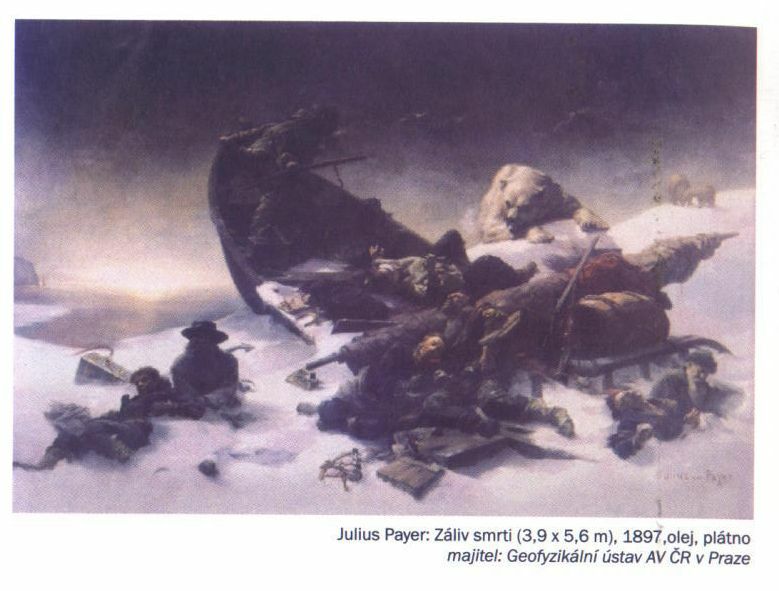 And thanks to Radim Neuvirt from Teplice (where Payer was born) we now know there is a painting by Payer dated 1880 and presumed to be a study for the Starvation Cove (although there are some doubts about it). The reproduction is from the book “Teplitz-Schönau”, Berlin-Friedenau, Deutscher Kommunal-Verlag, 1930. In 1930 it was apparently placed in the Teplice museum. According to communication by Phdr. Bohuslava Chleborádová, art historian of the Teplice museum, there is no such study in the collections of the museums. B. Chleborádová writes: "Since 1928 the so-called. 'Payer atelier' in the museum exhibited two paintings, which were loaned by Joseph M. Mühlig: oil studies for paintings Never back! and Bay of Death. Both paintings were taken back by J. Mühlig in January 1940. " Any knowledge concerning Joseph M. Mühlig or Payer atelier are welcomed at the above mention e-mail. 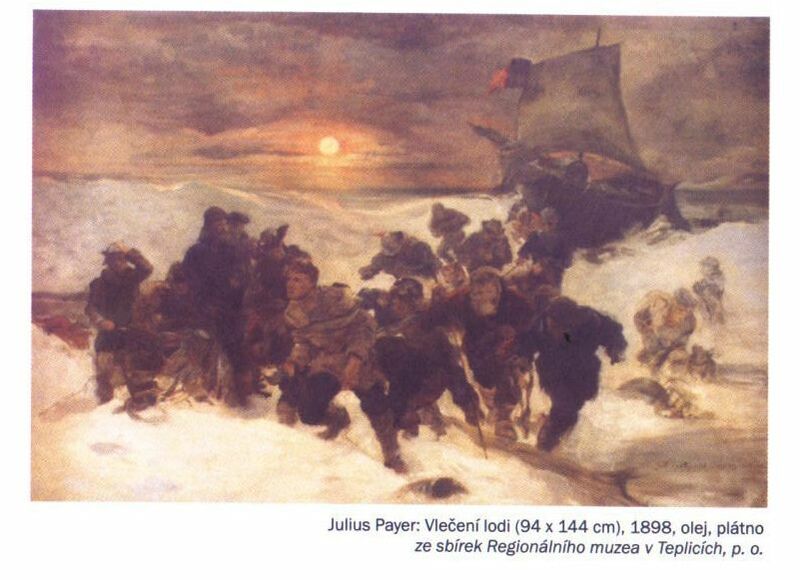 There is a small painting in the Regional Museum of Teplice called “Hauling the ship”, which is in fact a copy or study of the painting “Abandoning Vessels”. You may know some books, journals, articles or leaflets concerning the fate of these original Payer paintings. Some newspapers or journals could have reported on their sell to USA in 1896. Maybe you know somebody in Belgium who could know more and if the paintings really survived World War II. You may know more about the collectors O'Meara. 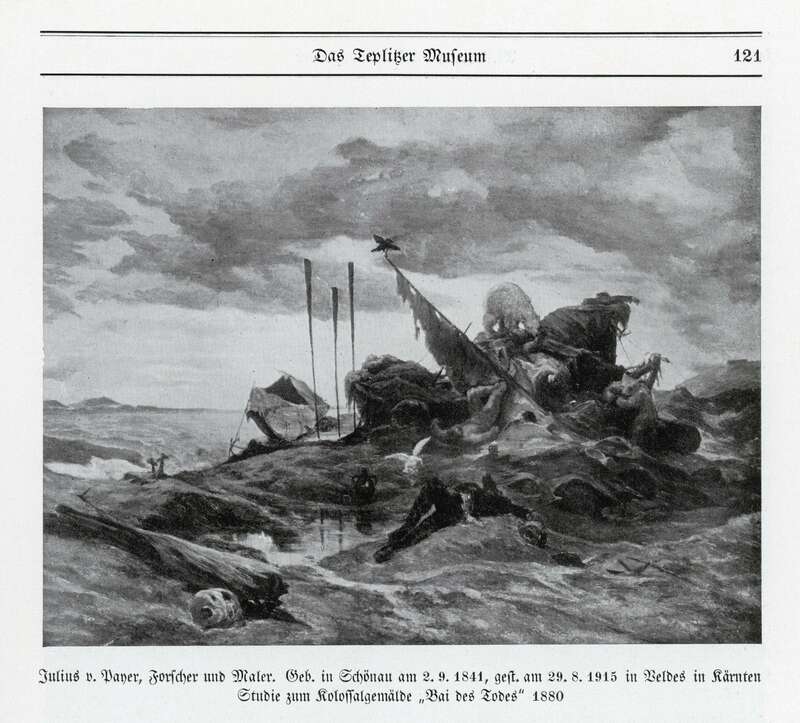 Some photos or reproductions of the original „Starvation Cove“ painting from 1882 could be published somewhere. Or maybe you just have any idea where to look for more information. We would appreciate any hint.